I’m starting a list of “Texts Worthy of Close Reading” by grade level for grades 4 through 11. This is a beginning. I encourage you to comment on the list and recommend additional texts. If enough of us send in suggestions, we will all benefit! I’ve written my rationale below the list. “Father Luis Jayme Criticizes the Behavior of Spanish Soldiers, 1772,” from Major Problems in California History, edited by Sucheng Chan and Spencer C. Olin (Boston: Houghton Mifflin, 1997), 59-60. “Richard Henry Dana, Jr., Criticizes the Mexicans in California, 1834,” from Two Years Before the Mast (New York: Modern Library, 1964 [originally published 1840], pp. 158-63, in Major Problems, 91-93. “Louisa Clapp Pokes Fun at Her Experience as a Gold ‘Mineress,’ 1851,” in Major Problems, 114-115, from The Shirley Letters from the California Mines, 1851-1852, edited by Carl I. Wheat (New York: Alfred A. Knopf, 1961), 83-85. “Frank Norris Excoriates the Railroad as ‘The Octopus,’ 1901,” in Major Problems, 168-171, from The Octopus, by Frank Norris (New York: Bantam, 1977), 31-33, 368-69. “John Steinbeck Portrays Social Pressures in Rural California, 1939,” in Major Problems, 269-272, from The Grapes of Wrath, by John Steinbeck (New York: Penguin Books, 1976 [originally published 1943]), 119, 144. “Hammurabi’s Code,” translated by L.W. King, http://eawc.evansville.edu/anthology/hammurabi.htm. “Mencius and his Mother: A Lesson Drawn from Weaving,” Lienu zhuan, translated by Anne Kinney, http://chnm.gmu.edu/cyh/primary-sources/189. “Selections from the Quran,” in Exploring the Global Past: Original Sources in World History, Volume 1, edited by Dale Crandall-Bear (Dubuque, IA: Kendall/Hunt, 2001), 88-93. “Ibn Battuta in Mali,” http://www.fordham.edu/halsall/source/1354-ibnbattuta.asp; soon to appear in History Blueprint Sites of Encounter in the Medieval World unit, at chssp.ucdavis.edu. The Song of Roland, translated by John O’Hagan, http://www.fordham.edu/halsall/basis/roland-ohag.asp. Popol Vuh (Maya), http://www.utexas.edu/courses/stross/ant322m_files/popolvuh.htm or http://www.criscenzo.com/jaguarsun/popolvuh.html. Galileo Galilei, “Letter to the Grand Duchess Christina of Tuscany, 1615,” http://www.fordham.edu/halsall/mod/galileo-tuscany.asp. The Common Core State Standards call for close reading at every grade level and in a wide range of subject areas. In the middle and high schools, history teachers can make a huge contribution to the efforts of their schools to meet the Common Core Standards by incorporating close reading into their courses. This would not be a sacrifice that history teachers make for the sake of their schools, but a positive move that will benefit history teachers, help their students and improve the teaching of history. After all, what does a historian do with a primary source? Read it once and get the gist? Or read over and over, posing different questions and looking at different aspects, in an effort to understand the author’s purpose and underlying agenda? If we develop questions and reading activities that help students act as historians, close reading becomes a strategy for teaching history, not something the English teachers want us to do. For elementary teachers who teach both language arts and social studies, the hurdle is more the switch from stories to “informational texts.” What does that term mean exactly? How can the teacher get her or his struggling readers through informational texts? First, I recommend that the informational texts be interesting. Most textbooks are not particularly interesting, and I would not recommend doing close reading using textbook passages. Secondly, I recommend that the texts we choose for our students should further either the social studies or science content standards of the grade levels we teach. The informational texts should directly serve as many educational objectives as possible. Both elementary and secondary teachers know that doing close reading will take a lot of class time. With so much to cover, how will we find the time to engage in close reading? While this decision has to remain in the hands of the teacher, department and/or school, I have two suggestions. Use the fact that students will not be tested on history-social science content this year to relax the pace of coverage. And start modestly. Choose a manageable number of texts (maybe 6 per year or 1 per month) to read closely. Choose texts that are worth time and effort and further your objectives for the students. The list above is partial and very incomplete. The selections for each grade level align with the California History-Social Science standards for that grade. Most of the documents are widely available on the web, although most need to be excerpted further, especially for the elementary and middle school grades. That work remains to be done. Please comment on this blogpost to add your choice texts to the list, or email me at slhutton@ucdavis.edu. 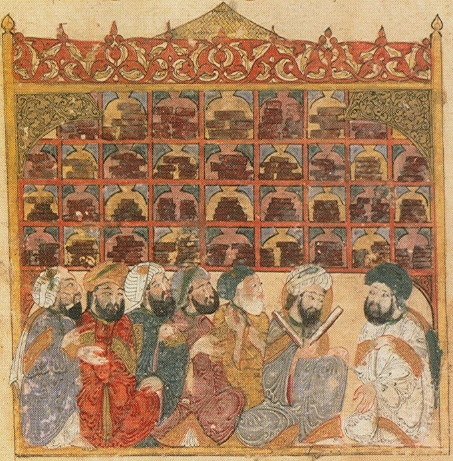 Scholars at an Abbasid library. Maqamat of al-Hariri, Illustration by Yahyá al-Wasiti, 1237, photo taken by Zereshk from text in the Bibliotheque Nationale de France. Wikipedia Commons, http://en.wikipedia.org/wiki/File:Maqamat_hariri.jpg. Douglas Fisher and Nancy Frey, Engaging the Adolescent Learner: Text Complexity and Close Readings (International Reading Association, 2013).